In November, Howard County voters chose Calvin Ball as County Executive, electing the first African American to fill that position. 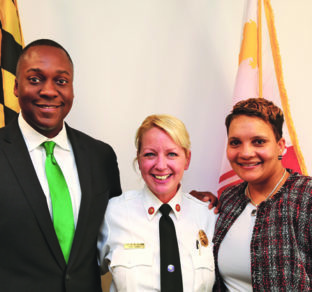 And now, he continues to make history (some might say “herstory”) with the recent appointments of Lisa Myers to be the county’s first female chief of the Howard County Police Department, and Christine Uhlhorn as the first female chief of the Howard County Department of Fire and Rescue Services. Both new chiefs have many years’ experience in their respective departments. Uhlhorn is a third-generation firefighter — her father and grandfather both served in the Baltimore City Fire Department, and other relatives have also fought fires and made rescues around Maryland. She said she vividly remembers visiting as a child the fire stations where her father, Captain Frank Uhlhorn, and grandfather worked. The single mom, 50, figuratively climbed the department ladder — which she also did literally while fighting fires — starting in 1989 when she became a firefighter recruit and emergency medical technician at the Long Reach station in Columbia, and rising through the ranks to assistant fire chief before her appointment as chief. At one point during those years, she trained Ball, himself a former firefighter and emergency medical technician. While growing up in Baltimore, Myers did not particularly want to wear a badge. Although she graduated from Coppin State University with a bachelor’s degree in criminal justice, her first choice for a career was that of mortician. But Myers eventually followed her university training and became a civilian crime lab technician in the Howard County Police Department. Like Uhlhorn, Myers has policing in her family. Her husband, Woody Myers, is a retired Maryland State Trooper, and her uncle, Dennis Mello, was the first black police captain in Baltimore. Over her 27 years at the department, Myers has held such positions as chief of staff, patrol division watch commander, supervisor of youth services, and public information officer. She has also represented the department in labor-management negotiations and on multiple boards, such as the African American Community Roundtable and the Police and Business Professionals Partnership. Myers agreed to come out of a recent retirement to take the reins as chief “because this is a great opportunity,” she said. The Howard County Police Department operates with a budget of more than $122 million. Of the 478 officers in the department, 69 are currently African American and 11 of those are female. Myers was asked about the Black Lives Matters movement, a nationwide protest movement that has also been active in Howard County. It grew out of clashes between police officers and African Americans in different parts of the country. “I think the movement is important,” she said. “That’s why a lot of my focus will be on community outreach. We have to have a strong policy and strong practices carried out by well-trained officers” who recognize the problems of minority communities, she said. Fire departments around the country still attract fewer female recruits than other former all-male professions. Only about 4 percent of firefighters are women, according to the U.S. Department of Labor, while female participation has risen to about 14 percent in police work and the military. Fire Chief Uhlhorn indicated she will be on the lookout for more female firefighters as she attempts to expand her department, which now consists of 500 career firefighter-emergency rescue technicians, and 400 volunteers at 12 stations, with a budget around $104 million. She put the current number of women career firefighters at 11 percent of the force, about 55 women, plus “many” female volunteers. “All that has now changed,” she said. In fact, in recruitment efforts for the department, she ran the First Alarm Girls Fire Camps, where 8- to 16-year-old campers spend a weekend learning what it takes to become a firefighter. Uhlhorn has taken command from former fire chief John Butler, who has become chief of the larger fire department of Fairfax County, Va.
Uhlhorn acknowledged that firefighting is both physically demanding and at times dangerous. In addition to the risks inherent in entering burning buildings, a growing concern is the cancer rate among firefighters, which she said is 9 percent higher than for the general public. The burning of wood, plastics, furniture, electronics and other building materials releases hazardous substances into the air that are known carcinogens. She said special steps are now being taken to minimize the risk to the firefighters, such as quickly washing skin and removing firefighting gear after a job, not wearing the gear around the fire station, and making sure equipment is cleaned before being returned to the fire truck. Uhlhorn now lives in Joppa in Harford County and shares custody of her 13-year-old son and 12-year-old daughter with her ex-husband. She said that both children have shown “interest” in firefighting, having helped out in the summer camp. “When I was a young girl, firefighting was more gender specific,” said the fire chief. “My parents said I could be whatever I wanted to be, and they would support me. I had firefighting in my blood. “Whatever my children choose as a career, l will support.” she said. What, for her, is the most important part of the job? “Making sure that every day and night everyone goes home safely,” the new county fire chief said.